I've just completed my 6-week SVA Trends in Photography and Contemporary Art : What's Happening Now mini-course. 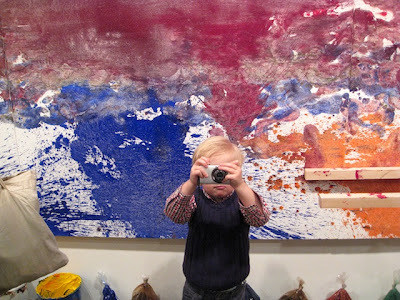 It's an indulgent immersion in the art world - feasting your eyeballs on everything from priceless icons of the modern art world to the proverbial "my 6 year old could do that." (Ah, but your 6-year old, my friend, is not named"Warhol"). We got to see the galleries of Chelsea, the Upper East Side and the Lower East Side, plus attend a Phillips de Pury "mid season" auction preview and a couple of Armory Arts Week shows. Some of us were budding collectors. "Look, and look, and look," said our teacher Brian Appel. "You will develop a really good eye for what you like and what's good." Some were budding artists - "send along a jpg of your work, one a week, plant the seed." It's been an exhausting 4 days - all the art fairs - Armory Show, Pulse, Scope Volta, Independent etc collide in one short, compressed period, causing a stampede from venue to venue. Check out the list of fairs. And it rained moonsoons on the last Sunday. I hope one day They Inc. will make the shows span 2 weeks instead of half a week, somewhat like Restaurant Week. I only got to see Pulse, Volta, the massive Armory Show. More about this soon. Then of course, there was the Phillips de Pury auction preview which in many ways, I enjoyed most. PHOTO GALLERY: My favorites at the Under the Influence auction and here are the results.